Preheat oven to 220°C (425°F). Place the sweet potato, 2 tablespoons of the oil, salt and pepper in a bowl and toss to combine. Place the sweet potato in a single layer, overlapping slightly, on a large lightly greased oven tray. Place a few thyme sprigs on top of each lamb loin and fasten with kitchen string. Place the lamb on top of the sweet potato, drizzle with the remaining oil and sprinkle with salt and pepper. Cook for 25 minutes for medium rare or until the lamb is cooked to your liking and sweet potato is tender. Set aside to rest for 5 minutes. While the lamb is cooking, make the oregano salsa verde. Place the oregano, lemon rind, lemon juice, garlic, oil, salt and pepper in a small bowl. 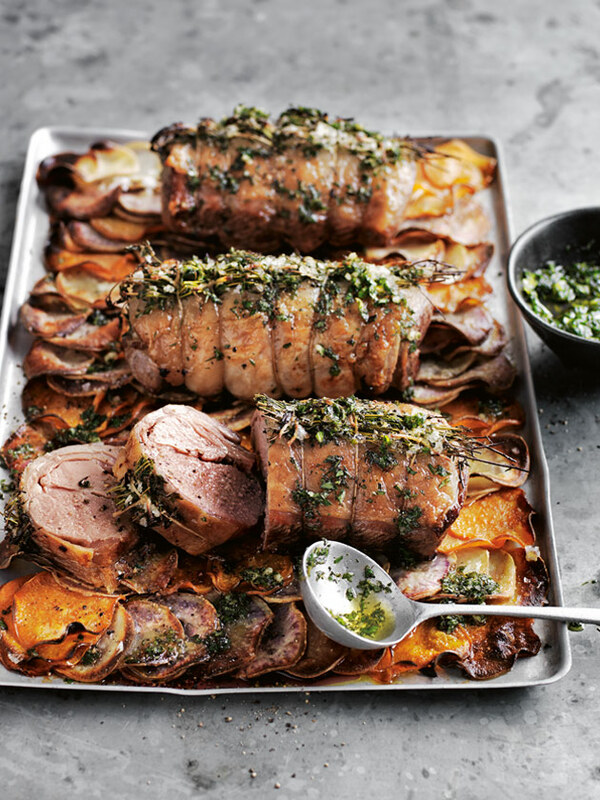 Serve the lamb with the sweet potato and oregano salsa verde. Serves 6. + We used a mixture of white, orange and Hawaiian (purple) sweet potatoes – they are all available from greengrocers.